The Tennessee senator is trying to pass a bill to check Trump's tariff power. Sen. Bob Corker, a Tennessee Republican, went after his fellow GOP senators for a second straight day Wednesday, saying he thinks his party is acting like a "cult" in the way it's backing away from doing anything it thinks President Donald Trump might oppose. "It's almost becoming a cultish thing, isn't it. And it's not a good place for any party to end up with a cult-like situation as it relates to a president that happens to be, purportedly, of the same party," the Senate Foreign Relations Committee chairman told reporters. The measure has several Republican cosponsors but Corker has accused GOP leaders of preventing him from adding his measure as an amendment to a must-pass defense policy bill because, as Corker charged Tuesday, they say they're worried about upsetting Trump. “No, no, no, we might poke the bear' is the language I’ve been hearing in the hallways: 'We might poke the bear. The president of the United States might get upset with us,’" Corker mocked his colleagues as saying. 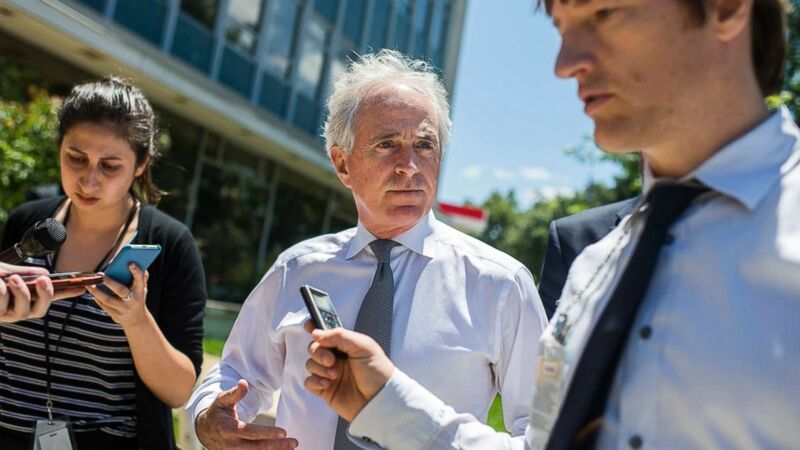 (Tom Williams/CQ Roll Call/Newscom) Sen. Bob Corker talks with reporters before the Republican Senate Policy luncheon at the National Republican Senatorial Committee, June 12, 2018. "The president has a tendency from time to time to do something ad hoc that hasn't been vetted with people around him and then sometimes they'll walk those things back," he said.